1: Features of HTML5. 2: Introduction to CSS3. 3: CSS3 Animation and CSS Frameworks. 4: CSS3 and SVG. 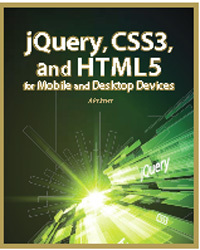 5: jQuery Fundamentals. 6: Animation Effects with CSS3 and jQuery. 7: jQuery UI Controls. 8: Introduction to jQueryMobile. 9: jQueryMobile Events and Animation Effects. 10: jQuery and HTML5 Technologies. 11: HTML5 Canvas and jQuery. 12: Charts and Graphs. 13: HTML5 Mobile: Android and iOS. 14: Looking Forward. Oswald Campesato (San Francisco, CA) specializes in Java, Android, jQuery, and CSS3/SVG graphics. He is the author/co-author of six books including HTML5 Canvas and CSS3 Primer (Mercury Learning).